Have you ever wondered what your smile might look like if that missing tooth wasn’t missing? There are several ways to fill that gap with a “tooth” that looks and feels exactly like your other teeth. An increasingly popular way to restore missing teeth is through dental implants. These are used as an alternative to dentures and bridges. Why? Because they have many advantages, including their completely natural appearance, their convenience and their ability to maintain bone mass – a quality that makes additional tooth loss far less likely. 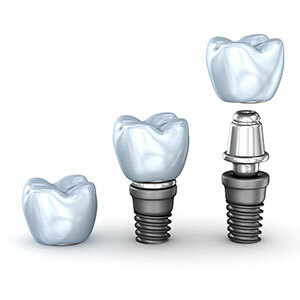 Implants are made up of a titanium screw and a post that is covered with a crown, bridge or denture. We place the implant into the jawbone where it replaces the tooth root. After several months, the implant attaches to the bone, so it now looks and “acts” just like a natural tooth. A patient needs to be evaluated to ensure there is enough bone available to secure the implant. Impressions are taken to provide the necessary mold for a customized implant. When the implant is ready for insertion, the doctor cuts the gum at the insertion site to expose the bone. The implant is inserted and the gums around the implant are stitched to close up the incision. Once the implant is firmly imbedded into the bone, a post is attached to it and then the doctor creates a permanent tooth replacement. At Wattle Grove Dental Centre we are always available to answer any questions you have about your dental health and the choices that are available to address specific conditions. If you’re concerned about missing teeth and your available options, or if you have any questions at all involving your dental health – feel free to give us a call.